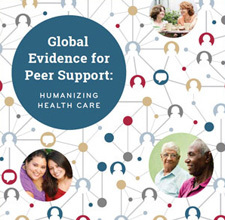 My comments address three general topics, the fundamental importance of social support in human behaviour and health, the strategic roles of peer support in prevention and health care, and some more general thoughts about behaviour change and health. Psychologists used to think that the basis for the connection between the infant and the mother was that the mother was the source of milk food. Harlow showed that, except when it’s hungry, an infant monkey went to the relatively warm, terrycloth mother on the left rather than the wire surrogate mother that was the source of milk. From this and a number of other studies, Harlow made the point that ‘contact comfort’, as he put it, is a powerful and fundamental characteristic of human behaviour. Can Medical Homes Contain Health Care Costs? A relatively small fraction of the US population consumes the vast majority of health care dollars (see our past blog). Often these patients present medically complex cases with multiple co-occurring physical and behavioral health conditions, exacerbated by social barriers that make accessing primary care difficult. In addition to the burden from medically complex patients, another often cited reason for the high cost of health care is the overuse of expensive and unnecessary medical technologies. Unnecessary expenditures from overuse are estimated to account for 10-30% of total health care spending. Chronic disease patients spend most of their time away from clinic, and they can often get caught unprepared or puzzled with managing their conditions. Instead of going to the emergency room when that happens, reaching out to a nearby peer can relieve potentially stressful situations and provide answers when healthcare professionals aren’t available. Organized peer support in the form of one-on-one coaching, group meetings, and telephone calls aren’t available to many people, especially in rural areas. Moreover, when patients struggle with everyday issues regarding their condition, they can’t wait until the next peer support meeting or doctor’s appointment. Now that 58% of the American adult population owns a smartphone, mobile apps are quickly filling this need, improving opportunities for connectivity and responsiveness in peer support. In the Android and Apple marketplaces, there are thousands of apps to help people manage their chronic diseases….